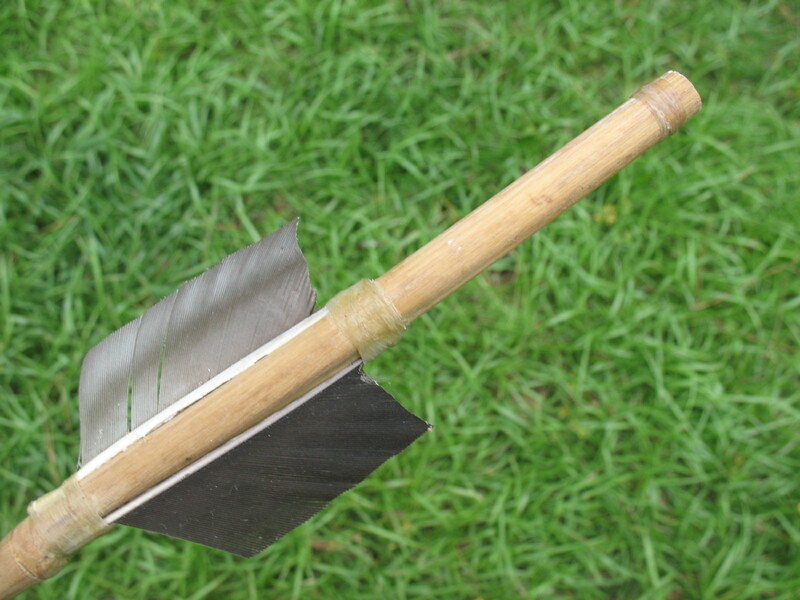 You can think of an atlatl dart as being either a small spear or a large arrow. Darts are generally constructed more like an arrow. That is to say they have a point on the front and fletching on the rear. 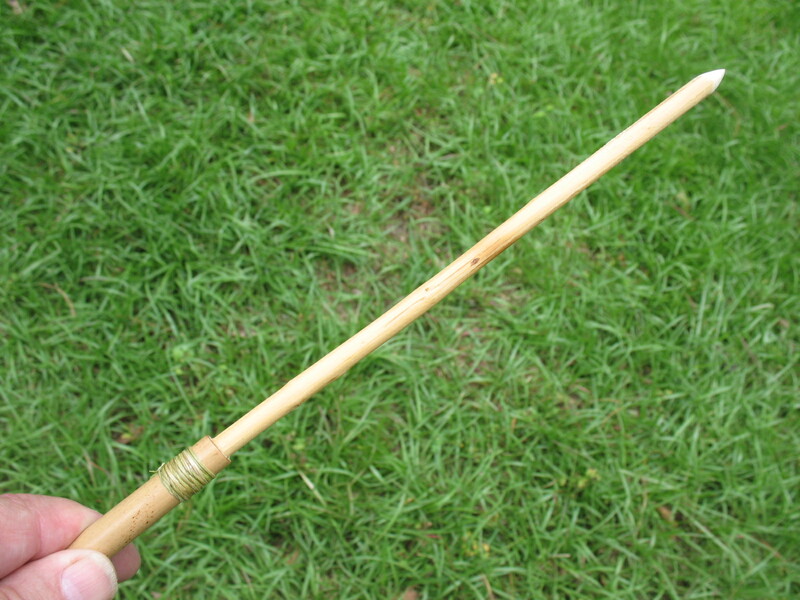 I make my atlatl darts out of river cane with a hardwood foreshaft. 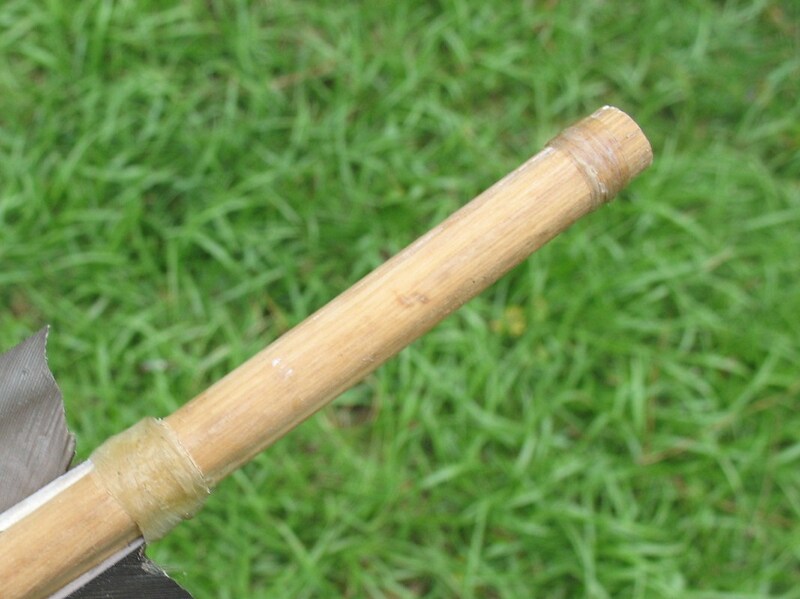 Select a straight piece of river cane that is about a half inch in diameter and four to five feet long. If the cane is not straight, you can use heat and bending to straighten it. I won’t go into any detail about this process as I have already covered it in my 1/28/2011 post on making quickie river cane arrows, and my 5/1/2011 post on making a river cane blowgun. In fact the whole process for making an atlatl tart is almost exactly the same as making a river cane arrow; just make the dart bigger. Cut a straight hardwood foreshaft to insert into the front of your river cane. You want the foreshaft to go down into the river cane and rest on a joint. This will give it more strength. Leave about a foot of foreshaft sticking out of the cane. This foreshaft can be sharpened to a point if you are making a quickie survival dart, or you can mount a point on it if you are taking a little more time to improve on the survival dart. It will help strengthen the join between cane and foreshaft if you wrap the cane with some sinew or plant fiber just below the foreshaft. 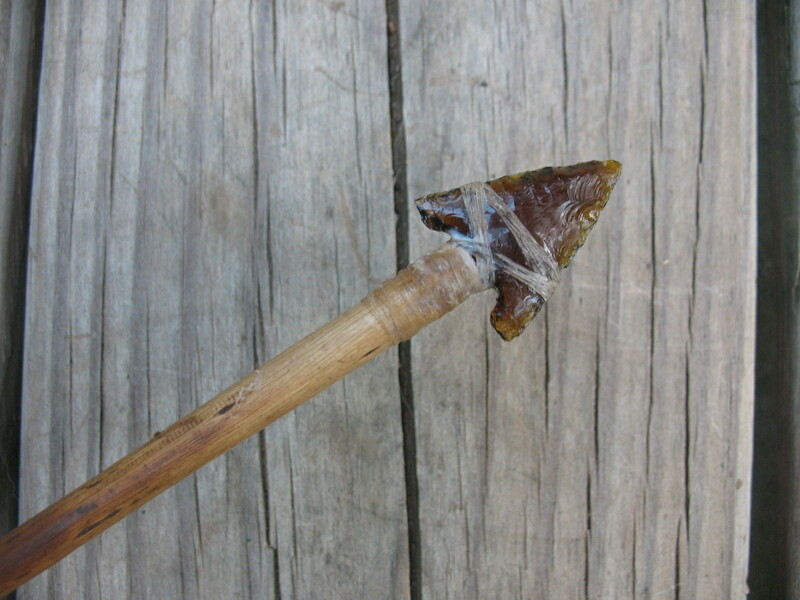 Pictured below: top, self point on dart; middle, point made of knapped beer bottle glass; and bottom, yucca fibers used to reinforce joint between cane and foreshaft. Although the dart is usable at this point, you will find that it will fly much better if you add some fletching to the back of the dart. 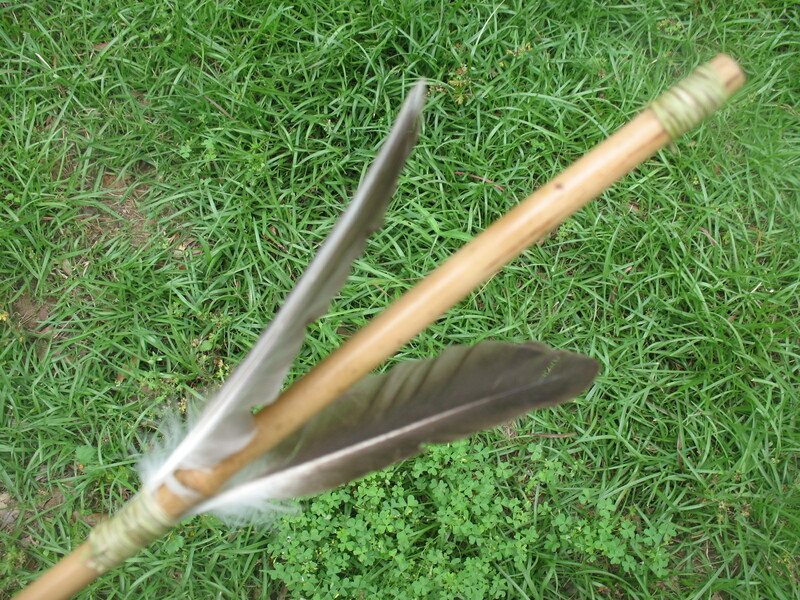 The fletchings may be a couple of whole feathers tied on opposite sides of the shaft using sinew or plant fiber, or you may improve on this by using split vanes attached with glue and sinew. Pictured below: top, whole feather fletching attached with yucca fiber; bottom, split vanes attached with sinew and glue. There is no string notch on the back of an atlatl dart. Your atlatl attaches to the dart by slipping the point of the little projecting limb into the hole in the back end of the cane. 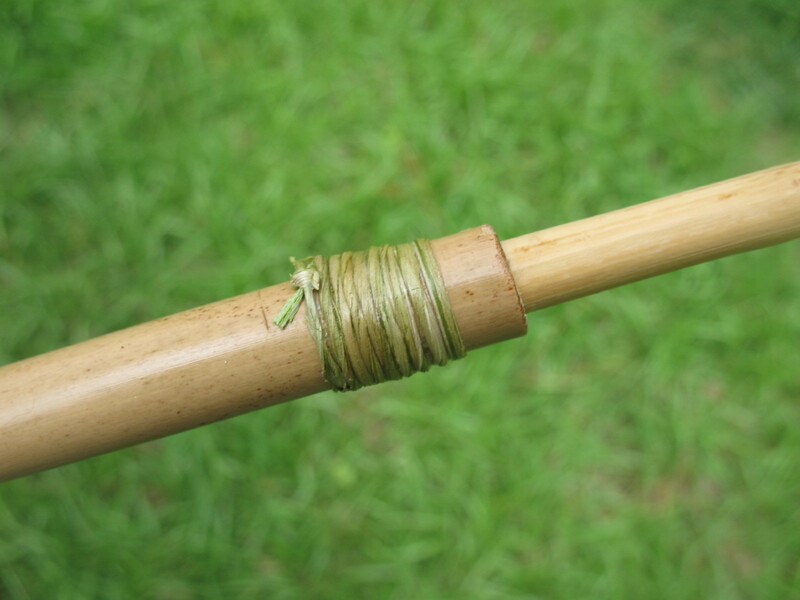 It is not a bad idea to reinforce the back of the cane with a few wraps of sinew or plant fiber. Pictured below: Rear nock reinforced with sinew wrapping. Next post will be a look at my fancy atlatl and dart.